Our eagerly awaited NetSupport and eCadets Online Safety Almanac launched at the world’s biggest edtech event, Bett 2019 last week. 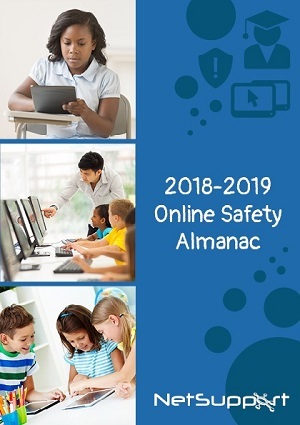 Bringing together key findings from front-line reports and research papers, the Almanac is essential reading for educators who are keen to secure or update their knowledge of online safety and associated safeguarding processes. I am honoured to be partnering with my great friend and associate, Al Kingsley, MD at NetSupport and his knowledgeable team on production of this much-needed and important directory, which will provide vital advice to ensure the online safety of children in schools and colleges across the UK. The Almanac is designed to give a valuable understanding of how children and young people are using and interacting with technology within educational settings and at home. As its author, I have drawn on my considerable experience in creating innovative solutions to keep children safe online, to produce a distillation of the most important and thought-provoking research relating to online child-safety. Bridging the gap between research and best practice, the Almanac will deliver an overview of the most pertinent ‘Stats and Facts’ relating to children’s online safety, covering hard-hitting topics such as: filtering and monitoring; social media use; cyberbullying; sexting; peer on peer abuse and governance. It will also offer ‘Top Tips’ and relevant case studies, providing practical help and guidance to assist frontline teaching staff.